This wasn’t an easy decision for these new parents to make. Although cochlear implant procedures have a very high success rate in obtaining a moderate level of hearing for the recipient, the surgical procedure would destroy Avery’s existing cochleae and leave her with no natural ability to hear. This process and decision would be irreversible. An alternative strategy that the family could have chosen, and foregone the surgery, was to use sign language as their primary method of communicating with Grace. But the couple worried that this option would unduly limit Avery’s ability to communicate with many of her family members who lived in Asia, because they only spoke Chinese. Nevertheless, after contemplating their options, the family decided that it was in Avery’s best interest to move forward with the surgery, choosing to believe and hope for the best for their daughter’s future. “After almost seven years, we look back feeling grateful for making that seminal decision. We were a family that was forced to make a choice, when challenged with adversity. Like all parents, we tried to focus on the long-term benefits for our child. After years of intense therapy and many periods of uncertainly, we can confidently say it has been working out. Today, Avery can speak Chinese and communicate with her relatives in Asia! Moreover, our family has been transformed for the better through this experience. We are tougher and more resilient. While it’s nice to think that it was our parenting skills that made the difference, the reality is that Avery overcame many challenges by simply being determined, gritty, and motivated” the parents explained. This is where their vision for developing a family business began. Thuy, a former Marine and Senior Government Official, decided to step away from his career to focus on building a family business that would impact and inspire others—a business inspired by his daughter, Avery. The family named their business DGM (“Determined, Gritty, and Motivated”), after the attributes they see in their daughter. Their first product was the result of tackling one of many parents’ biggest challenges—especially parents of children with special needs—TOO MUCH STUFF. “For us, it was essential to get all of Avery’s hearing gear, plus countless other items to care for two kids, into ONE bag. We also had to keep our kids’ liquid snacks from getting mixed with the digital devices. That’s how the idea for the DGM backpack came to be. This backpack is designed to carry so much more than diapers and wipes. With its 16 compartments, we now can bring everything we need for trips as simple as a short hike, to daylong family outings—and every item is easily accessible” Thuy and Grace explained. A portion of the proceeds from backpack sales go to supporting Chattering Children, a nonprofit organization dedicated to helping children with hearing issues. Thuy and Grace acknowledged that while it’s scary being entrepreneurs, Avery’s example of determination, grit, and motivation to succeed, despite daunting hurdles, are what allow them to push forward and to create a successful business—a business that inspires others and gives back to other families with similar life experiences. 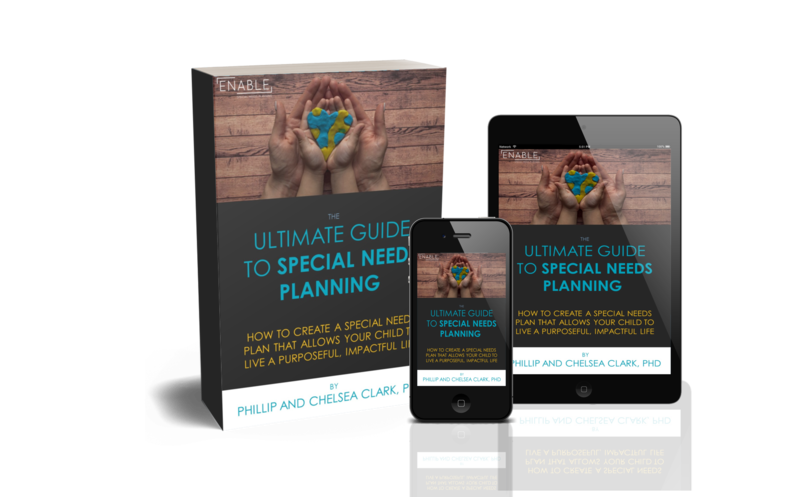 *Please Note: ENABLE Special Needs Planning, LLC, is in no way affiliated with Determined, Gritty, and Motivated (“DGM”) nor does ENABLE receive any monetary benefit from your engagement with DGM. We are simply sharing this information about the company for your knowledge and potential benefit. Next postWhat’s an IEP? What should it contain? and how do I keep it organized?